Nine things I learnt at our ‘Urban Freight: The Last Mile Challenge for Cities’ conference | En Avant! On Friday 26th September 2014, pteg​, together with Landor Links and Transport for London, held a conference on ‘Urban Freight: The Last Mile Challenge for Cities’. The event was attended by over 60 UK and international delegates and speakers from transport authorities, freight operators, retailers, campaign groups, charities, consultancies and research bodies. The ‘last mile’ of distribution, as goods travel to their final destination in the heart of city centres, is potentially the most significant freight issue for urban areas. These goods include retail stock, office supplies, documents, parcels (including e-commerce deliveries) and construction materials. All must find their way to shops, offices, bars and restaurants, building sites and homes. The way in which these goods are delivered has implications for congestion, air quality, noise, safety and the overall urban environment. Delivering freight cleanly, safely and efficiency into the heart of cities requires innovative approaches. Our conference explored these issues through a series of quick-fire, inspiring presentations from key players in last mile deliveries. 1. Freight works. It works in that the shops have milk and newspapers and the pubs have beer. This isn’t a sector that falls down on the job. Stuff gets where it’s supposed to be. 2. Freight doesn’t work. It doesn’t work in that lorries kill cyclists; old trucks and vans pump out carcinogens; and streets full of vans and lorries are nobody’s idea of an urban realm they want to live in. 3. Freight is dynamic and market-led. As diesel truck and van access to sensitive and congested urban environments becomes harder and more costly, the industry is responding. Already around one to two per cent of logistics is green and innovative – like using cargo bikes and zero emission electric delivery vehicles. Public policy can raise those percentages. 4. The largest cities, where congestion and environmental pressures are greatest, are where innovation is happening fastest. In Paris, major retailer Monoprix already get their deliveries via trains into city freight facilities before low emission gas delivery vehicles transport them the last mile for delivery to individual stores. Elsewhere in Paris there’s a barge and cycle delivery operation and a ‘logistics hotel’ is planned as part of a mixed use development. 5. Consolidation centres on the edge of towns and cities (where trains or big trucks deliver for onward distribution to city centre stores and offices) have been an aspiration of policy makers for decades but results have been mixed as costs are high and logistics companies don’t want to know. However, if the savings to logistics companies of delivering once to a depot rather than multiple times to city centre locations can be captured and the squeeze goes on the wrong type of city centre delivery vehicles (through emissions restrictions, pedestrianisation and so on) then maybe the sums begin to add up. 7. Cities already have central hubs for freight deliveries that are largely unused at night and can be served by 125mph mobile warehouses. These hubs are called railway stations. For example, Euston station has a huge logistics hub built in the 1960s. But even where such facilities don’t exist, empty nightime platforms can often be used. The first stirrings of using stations as the access point for city centre deliveries have already happened, including trials using Euston as the railhead for local electric and low emission van deliveries (there are 100 supermarkets within two miles of Euston). 8. Technological change and vehicle standards are key. For example, the ability of cycle delivery firms to compete changes with the availability of lighter and innovative cargo carrying systems and with the legal framework governing battery power assistance technologies. It changes too with access to the highway and shopping street environment. 9. Finally, freight isn’t boring! It’s part of (rather than an add on to) a much wider debate about what kind of cities we want to live in and how smart technologies are creating new opportunities: for entrepeneurs; for cleaner, safer and more attractive environments; for getting people and goods where they need to be efficiently. In short the smartest cities will see the opportunities from getting the ‘last mile’ right. 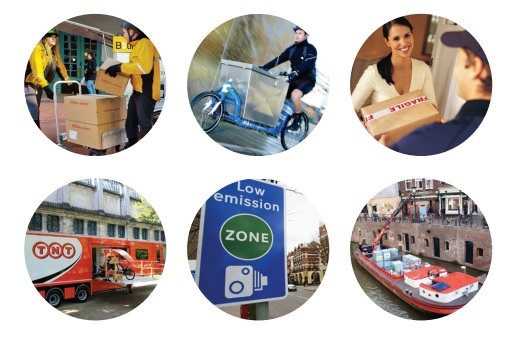 Visit our ‘Urban Freight: The Last Mile Challenge for Cities’ hub to download presentations from the day.